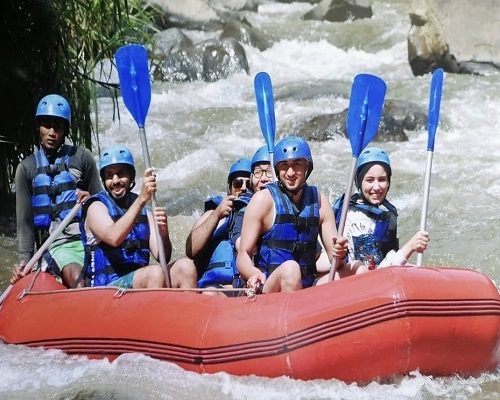 Bali Trekking and Rafting Tour is an Bali Double Activities Tour Packages we designed to make double impressive experience by allowed you to trekking the Mount Batur Volcano and then continue to do the White Water Rafting at Ayung River ubud. Is the perfect combination we designed to make your holiday beyond of impressive. First Our friendly Bali Driver will pick up early in the morning and then directly to go to the Mount Batur Trekking start point, And then you will enjoy the trekking for 2 hours to get to the top and see the amazing view of sunrise with breakfast serve by our trekking guide. After enjoy the amazing view sunset you will lead by our trekking guide to the finish point. After arrive at finish point you will meet with our driver and then continue to enjoy the adventure by dong the White Water rafting adventure at Ayung River ubud for 2 hours, is great experience to try the rapid class 2 and 3 with beautiful panorama surrounds. You will feel like in different world after see the combination water and beautiful view. After finish rafting you will enjoy lunch buffet indonesian food and then after finish lunch we wil heading back to your hotel. this Bali Trekking and Rafting Tour is the most choices for the exciting combination adventure and will assist by our professional Balinese Driver will make the adventure more fun.